obgothic | Ignite the flame that will help you guide your way through the darkness and return with a story to tell. obgothic Ignite the flame that will help you guide your way through the darkness and return with a story to tell. I love vampires and in the past few years I have indulged in the guilty pleasure of reading the Southern Vampire Mysteries by Charlaine Harris: yes the ones about True Blood and Sookie Stackhouse. Before them I loved reading the Vampires Chronicles by Anne Rice until I got to Memnoch the Devil, which lost it for me, though I will say that I very much enjoyed Pandora, which is not quite part of the Vampire Chronicles. In the very beginning I read Dracula by Bram Stoker. The book took two efforts to get into it since the language is older and the way the book is presented, a compilation of diary entries and newspaper articles, is something for a 20th and 21st century mind to get used to. Once I found my rhythm, the 500 plus pages melted away as the pages seemed to be turned by the characters themselves. It seems that in the beginning vampires were cruel and vicious as you can read about in “Carmila” and the “Vampyre,” then somewhere around Interview with a Vampire they became nicer drawing from us sympathy and even admiration. BUt throughout all earlier vampire stories there was a romance atmosphere, same as with most early gothic fiction, which I would say could be called gothic romance for multiple reasons. Then Twilight and True Blood happened and vampires became the hottest undead on the block, like rock stars even. I have some friends who say no they are monsters as we should either run away or destroy them. I understand what they are saying and I agree, but I also believe that vampires and romance go hand in undead hand. 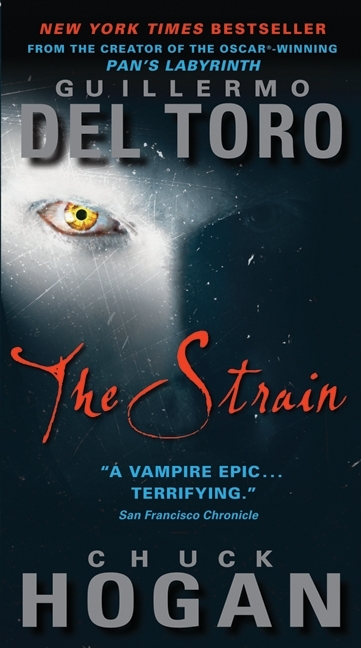 But I do love a good scare from something different and imaginative so enter The Strain by Chuck Hogan and Guillermo del Toro. Like so many of the book I read I found this book in mass-market form at a library book sale back in 2010. The cover caught my eye and the description said that I should read this before the other books I bought that day. Two days late I finished the book and was quickly trying to find the second book, The Fall. Yesterday I finished the third book of the trilogy, The Night Eternal, and though the first book is by far the best, the whole trilogy is terrifying. This is horror in vampires, and these are not your traditional vampires. They are more like zombies controlled like drones through their original maker, their master. Since Guillermo del Toro is one of the co-authors all signs point to this being a movie one day, but I think it would make a better TV series then a movie. As I was reading the first book it felt like reading a script for a series, which worked well for the story. Throughout the trilogy, but mostly in the first book, are these side scenes where we see the simultaneous impact of these horrible creatures. We see that they are merciless and are nothing to be desired. Over all I found these books to be creative, fun and entertaining. 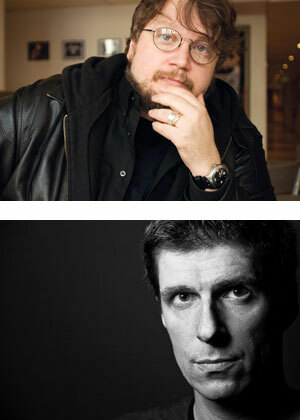 I am a huge fan of del Toro’s films and now I am a fan of his books. There are several book trailers that are fun to watch which you can see here and here. Before I end I need to give an ‘I’m Sorry’ to Chuck Hogan whom I had never heard of before I read these books. He is the author of The Town, which was made into a great film with Ben Affleck and Jeremy Renner. Sometimes writers slip by and we do not hear about them. Caroline . . . NO, Coraline! Wow, it has been a while since I last wrote on this blog. Nearly 3 months, 25% of a year. I think I got burnt out after writing so much when I first started to blog. Add to that the fact that I didn’t feel as gothic-fiction-like around Christmas and New Years. But, I love the weird and wonderful and I can’t stop reading or writing about it. I want to start this year off with a book that I read in a day and have read twice. It is a book about a girl living in a new and strange house with other strange people in the apartments above and below. 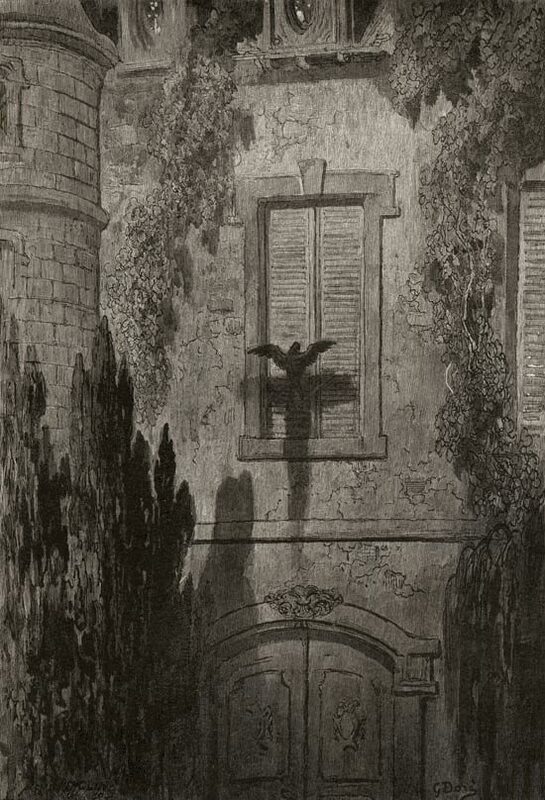 The house is the setting of the gothic imagery and in the house lies secrets and evils. The book is Coraline by Neil Gaiman and if you have never before read a Neil Gaiman story this one is a great place to start. That is all I shall tell you about the book. Inside the pages are some terrific illustrations by Dave McKean, which you can read more about here. I personally love it when authors add some, not too many, but some clever illustrations to YA stories. There are a total of fifteen illustrations, but they do not take anything away from the stories imagination. What I mean by that is the story still allowed me to use my own imagination. 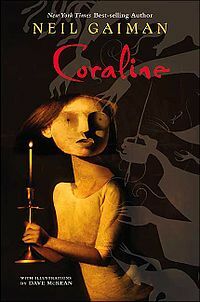 This book was first published in 2002 and in 2009 director Henry Selick, whom most people know for The Nightmare Before Christmas, help bring Coraline to the big screen. I have to admit that the movie is great, though of course not as good as the book, and there were two scenes that were my favorite in the book that are completely left out in the movie. The transition worked well since the book is fairly short and came with some great imagery. Read the book and then watch the movie. I did. Neil Gaiman was recently on the radio show Wait Wait Don’t Tell me, interview here, and he talked about where he came up with the idea for the book. Basically he wrote about what he had experienced and what he knows. He mentions in the interview, “When I was a kid, we actually lived in a house that had been divided in two at one point, which meant that one room in our house opened up onto a brick wall. And I was convinced all I had to do was just open it the right way and it wouldn’t be a brick wall. So I’d sidle over to the door and I’d pull it open.” Sadly it was always a brick wall, but not for Coraline. To learn more about the wonder that is Neil Gaiman you can visit his website here, at mouse circus here or just google him and see what you find. If you are on facebook or twitter Neil is always blogging and post his thoughts and ideas. A while ago I read a great book titled The Sherlockian, which is a story about the missing journal of Sir Arthur Conan Doyle. 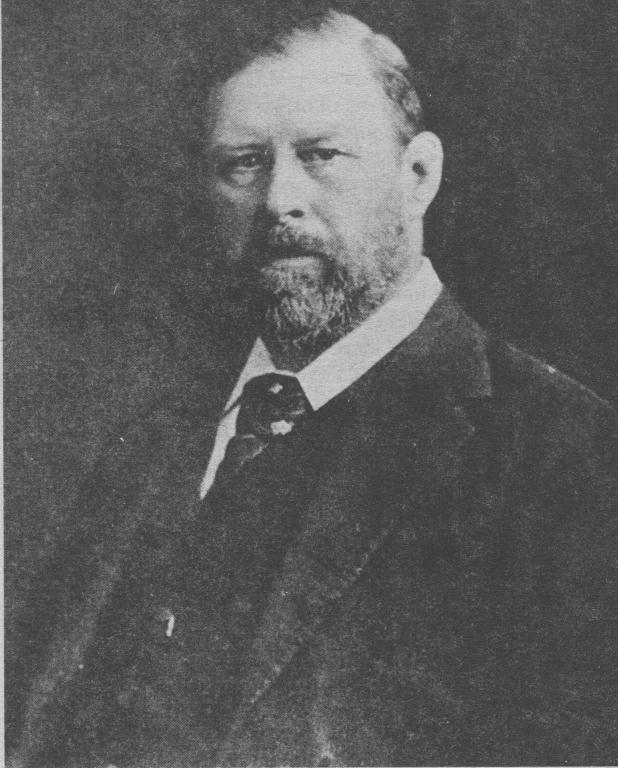 In that story there are two sections, one in the present day and one in the past, which follows Doyle and his good friend Bram Stoker. I mention this because just recently a friend of mine sent me a link to an article regarding the missing journal of Bram Stoker. It turns out that Stoker and Doyle have a lot in common. In real life they were distantly related cousins, they both wrote stories about vampires, and are both overshadowed by a single character of their creation. I ask you to name, off of the top of your head and fingers, another book or piece of work by either of these two authors that has noting to do with Sherlock Holmes and Count Dracula. What they also have in common is they both have had missing journals suddenly appeared recently in the last few years. The disappearance of Doyle’s journals is much more interesting, partly due to the fact that he has written some of the most famous mysteries. As you can read in this article, Stoker’s missing journal was hidden in plain sight, on the bookshelf of one of his descendants. Not as interesting, and a little humorous. I tell you this because there will be a book, which is to be titled The Lost Journal, to be published early 2012 to commemorate the 100 anniversary of the creator of Dracula’s death. Halloween is my favorite holiday and not because of ghost stories and horror films, though I am partial to a good thriller or a good cult classic. Halloween is probably the oldest tradition that humans still practice even though the names and exact tradition of this celebration have changed. This is a unique time of year where everything changes. The weather grows colder causing the leaves to change and increasing the value of the harvest. I know that the harvesting and preserving of crops is not as clearly as important to the modern world, but once upon a time with out the harvest there was no surviving the coming winter. Once there were people that gave sacrifice to guarantee that the spring returned. Many people once feared that when the weather grew cold, the spring and summer would never return. But rather than go through the history of Halloween, which can be easily googled, I want to talk what stories put me in the Halloween and autumn spirit. First, are the stories of Ray Bradbury. Perhaps my favorite author, Bradbury writes with great imagination but in a way that is cleverly entertaining. His stories are scary yet still fun and not as challenging to read at Lovecraft. 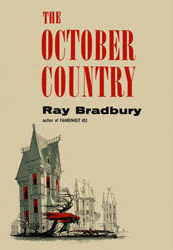 My favorite collection of short stories is The October Country (1955). All of the 19 stories are worth reading and of them my favorites are “The Lake,” “The Emissary,” “The Scythe,” and “The Man Upstairs.” One of these stories is about the grim reaper, another about a zombie, and one is about a vampire, but I’ll let you find out which one is which. Continuing with Bradbury is a book that is, in its typical Bradbury way, a story made up of short stories. The books is called From the Dust Returned. I first read it last October and it was unlike any other book I have ever read. The stories are beautiful. Even though they are connected, they can stand alone, which can be challenging at times. I shall give you this hint. It can be tricky to get into, but I promise that it is worth it. I found myself rereading the first chapter/story in order to ground myself in the weird Bradbury world. Moving away from Bradbury another author I love to read this time of year is Ambrose Bierce. He is a little old school, but still a great read. Bierce lived an interesting life. He was a soldier for the Union in the Civil War who made maps for the officers. After the war he became a great writer and wrote many fantastic haunted stories including “An Occurrence at Owl Creek Bridge,” and “The Death of Halpin Frayser.” Owl Creek Bridge is a story that, like The Legend of Sleepy Hollow, I can read many times over and still feel like it is new. For more about Bierce enjoy this strange website. For a much more modern author, I love the work of Neil Gaiman, who has written many great short stories in several collections. My favorite is M is for Magic. Of these 10 stories by two favorites are “Troll Bridge,” and “October in the Chair,” which is a tribute to the work of Ray Bradbury. 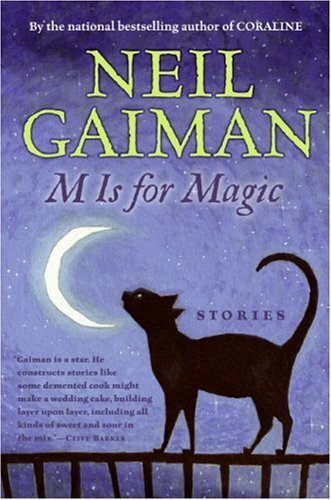 Gaiman has also written a few young adults books that are great for this time of year. The Graveyard Book is an obvious choice, but I also like Coraline, which yes, was made into a film a few years ago. The film is a lot of fun, but the book is much better and has a great scene that was left out of the film. Each year for October I feel a little overwhelmed by the amount of great ghost and horror stories there are to read. It is the same with novels as there are always too many to read and not enough time in the day and night to read them. Short stories are worse since books contain many short stories and when you read someone like Bradbury or Lovecraft you learn that they have written dozens and dozens and hundreds of short tales and novellas. For me, Halloween is a great time to put down the novel and indulge in all the short stories I can find time for. This year, my focus is on H.P. Lovecraft. I have read some of his work before and loved what I have read. Even though he is a terrible author when it comes to dialogue, his monstrous descriptions make him the king of horror. Tell me about what short stories and authors you like to read during this time of year. We all know the story of Frankenstein and many of us have seen the different films with the stiff arm monster with bolts in his next. 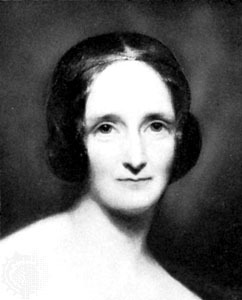 I first read the fantastic tale by Mary Shelley when I was in college and was surprised by how much this 19th century novel felt like a modern thriller. And in many respects it is a modern story showing how much humans have accomplished in the world of medicine and science, while also asking the question of how much is too much. Can humans accomplish too much through science? It is hard to believe that Shelley wrote it when she was only in her early 20’s in 1818. When I was young and I first saw the 1931 film with Boris Karloff, who also did the voice of the narrator and the Grinch in the original cartoon of the How the Grinch Stole Christmas, as the monster I always thought that the monster was named Frankenstein. As I have grown older and have reread Frankenstein as well as other additions to the legend, I come to understand that the monster is named Frankenstein. What is so great about this story is there are two monsters and there are two victims. Both Victor Frankenstein and his creation are villains in the story as they explore the new limits of human understanding of life and death. Like vampires and Dracula, Frankenstein and his monster have been recreated in dozens of films (Son of Frankenstein, House of Frankenstein, Young Frankenstein, The Curse of Frankenstein, The Horror of Frankenstein, Lady Frankenstein and the Bride of Frankenstein. There have also been numerous books written about the monster and his maker. First, there is The Casebook of Victor Frankenstein by Peter Achroyd. This was my first Peter Ackroyd novel and from I have heard from others I need to read more, but first things first. This was a great book I read for Halloween two years ago and I have never forgotten it. He has taken the wondrous tale and transplanted it with modern day knowledge in the world of science from the 19th century. With the power of hindsight he has remade, though loyally as you can see, this story with the background of history during one of the most amazing times of scientific discovery, which you can read about in The Age of Wonder, by Richard Holmes. To list some of his historical characters you will find Samuel Taylor Coleridge, Percy Bysshe Shelley and my personal favorite, Humphrey Davy. I know that many people will think that this book sounds like the remake of the film Cape Fear, and though I admit I felt the same when I read about this book, I will tell you that this book respects Mary Shelley as it builds on what she has done in such a way that makes this book special in its own respect. For more about this book here is a review from the New York Times. 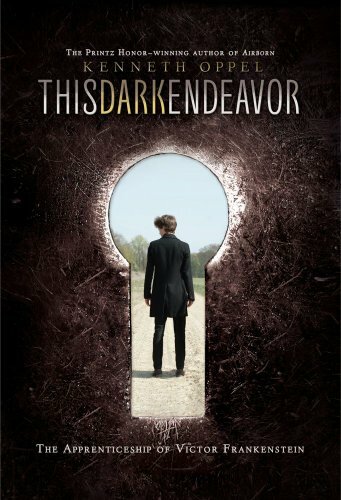 Second, there is This Dark Endeavor by Kenneth Oppel. This is a fun story that follows the life of Victor Frankenstein when he was only in his 16th year. I admit that I have often wondered what kind of life Frankenstein lived before we first meet him in Shelley’s story. What type of childhood did this mad genius have? Who were his parents and who were friends? Did he have any siblings? Oppel took on the challenge to create the young adult life of Victor in the form of a young adult story. Like Achroyd, Oppel respected what Shelley created. When you read his story you can see the hints of the future as you know how this young man will die. For more about this story, click here. I have no problem with authors using their imagination and telling the story of how a remarkable literary character came to be, as long as it is done well. My first experience with such a story came not that long ago when I read Finn by Jon Clinch, which tells the story of Huckleberry Finn’s father. (Another story I highly recommend.) To me this is why we have imagination and why authors write. It is the very best stories that stay with us and make us think, thereby inspiring others into imagining the story expanded into an entire world. Why are Frankenstein and Dracula remade and retold into hundreds of different stories in both books and films? Because they are the two best gothic novels ever written. Frankenstein is one of the most iconic Halloween characters that has no doubt inspired other horror stories. Please tell me about what you like to read for Halloween. 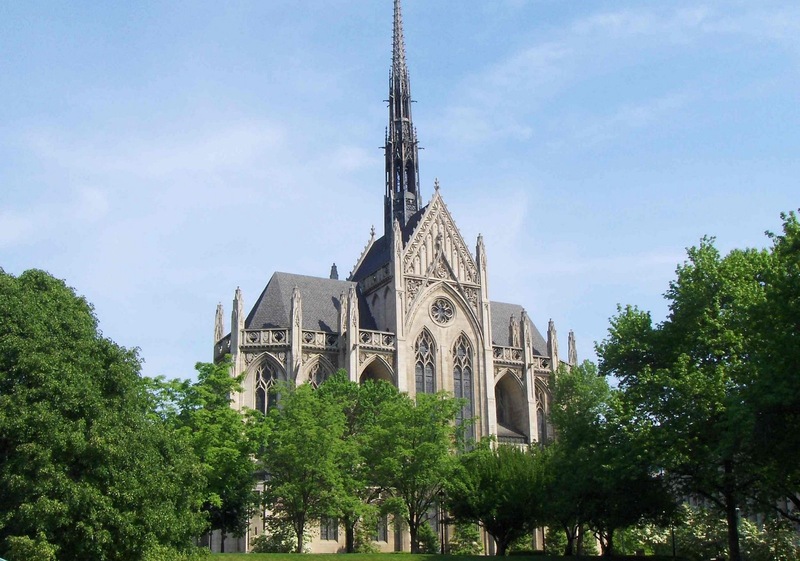 Yes, there are cathedrals in Pittsburgh. There are many and they are beautiful. If you ever have the chance on visiting this once frontier town take that chance and visit. The city is beautifully situated along the banks of two rivers, the Allegheny and the Monongahela, and it is here that they both join to form the Ohio River. While visiting two weekends ago I saw that fall was moving in quickly and the air changed to that wonder fall freshness. What really caught my eye was the Cathedral of Learning. This could be the most wondrous structure I have ever seen both inside and out. I never knew it existed until I drove into Pittsburgh and saw it off to my right from the highway. There is stood, very tall, between the trees off of highway 376. Upon closer review I saw that the structure, though clearly inspired by gothic architecture, is not that old. This second tallest education building in the world broke ground in 1926 and finished eleven years later in 1937 after delays due to the Great Depression. To help fund this project through tough years, school children were asked to to contribute a dime to “buy a brick.” It worked, and now thanks to Chancellor John Bowman and the children of Pittsburgh this magnificent structure stands as a center for learning. Inside the building is even more beautiful as vaulted ceilings push the height of the ground floor to showcase a grand enlightenment. Through this area can be seen corridors through archways, tunnels through the towering pillars and a place that invites imagination. While here I wanted to do nothing else but marvel at this wonder. I could only imagine what my imagination would feel if I could bring a book like Frankenstein or The Castle of Otranto to read under this atmosphere. Throughout the first and third level are a series of classrooms that make up the Nationality Classrooms. With approximately 27 classrooms, each one is dedicated to a different countries and nationalities. In these rooms some of the featured countries are Austria, Japan, Israel, Ukraine, Wales, Czechoslovak, Italy, Ireland, Lithuania, Greece, Scotland and yes, they have a Romanian classroom. And each room is decorated and designed by a person of that nationality representing their country and their history. My favorite room is the Armenian room. The next gothic build I saw was during nighttime. When I first saw the Heinz Memorial Chapel its top tower looked strange. Though the outside of the build was illuminated by ground lights the tower stood black in the background as if it were afraid of the light. My initial thought was that since it stood on top of the building the ground lights were unable to hit it. When I came back the next day I could see that I was half right. I saw that the tower is an entirely different shade from the rest of the chapel. This gives it a great effect at night and during the day it looks like it is always in shadow. 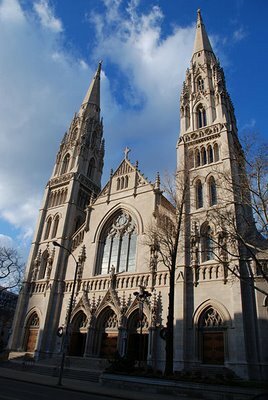 Anyway, the Heinz Memorial Chapel was build out of the will of Henry John Heinz in honor of his mother, Anna Margaretta. 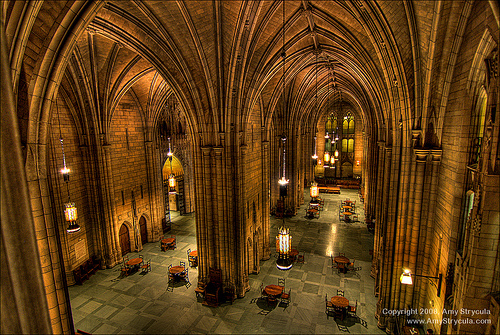 Construction broke ground in 1933 and the chapel was completed in 1938, one year after the Cathedral of Learning. 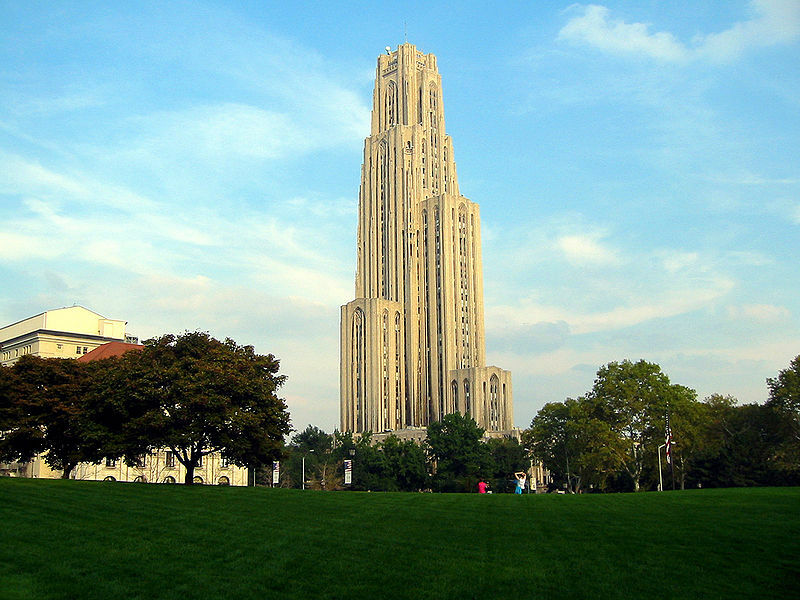 What is fun about this is the fact that these two buildings are right next to each other on the campus of the University of Pittsburgh. While I was touring it began to rain and I actually took refuge in both buildings to take a picture of the other. Sadly my pictures were lost. Finally, Saint Paul Cathedral. Not too far from the first two building is this grand 14th century style gothic cathedral. It was designed by Egan and Prindeville, a company based out of Chicago and was built by a Philadelphia contractor named Thomas Reilly. This build is more than 240 feet and is beautifully designed with great details on it facade. It is the oldest of the three here mentioned, opening its doors in 1906. Since I was visiting on Saturday I was unable to go inside two of the three of these, only seeing the Cathedral of Learning. The reason is the chapel and the cathedral were both occupied by weddings. It seemed that there were weddings all over Pittsburgh and a gothic church is a prime location. Indeed it is beautiful and there is a magic about this area. With these three structures as well as many more great buildings this is a great place for the imagination of someone whom loves gothic lore. If you have any stories about these three gothic builds please share them. When we think of gothic fiction in American most people minds turn towards Edgar Allan Poe, Washington Irving or even Nathaniel Hawthorne. 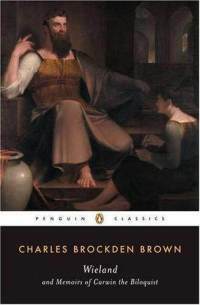 Truth is the person most responsible for creating not only the gothic presence in the New World that inspired the authors above, but also developing a new type of gothic literature is a man by the name of Charles Brockden Brown. Brown was born in Philadelphia in 1771 to a merchant Quaker family. 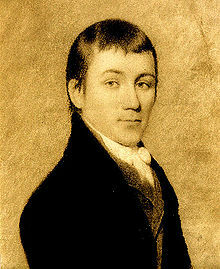 His great-uncle, Charles Brogden, was the first Registrar of Philadelphia and a man whom worked with Benjamin Franklin. Interesting fact, the Brown family was criticized for not openly supporting the American Revolution. His father was accosted and accused of being a Tory all because of his Quaker pacifism. During the war Brown’s father was charged with Tory sympathies and sent to Virginia in exile. The family business was ruined and the young Brown was tragically separated from his father. This series of events would play a huge role in steering Brown to a life of writing. I mention this last point about the physical and mental abnormalities because it is important when trying to understand the nature of Brown’s writing as a gothic genre. 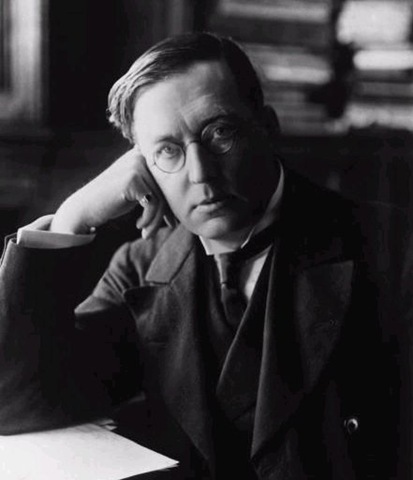 In each of his two famous gothic novels, Edgar Huntly or, Memoirs of a Sleep-Walker and Wieland and Memoirs of Carwin the Biloquist, we find elements of science and the understanding of the human mentality to be central to the creation of the story. As Jay Fligelman writes, “Brown, views the psychology of human behavior as the real realm of ultimate mysteries. If the Faustian agenda of enlightenment science sought to demystify the world, Brown sought to remystify it.” What this means is if the emergence of science took away much of the mystery of our world and the stars, Brown wanted to find the mystery in science. This idea is shown in Wieland where we find the antagonist is a man named Carwin whom has many talents. He is a professional Biloquist, which is a fancy archaic version of the word, ventriloquist. In the story, Carwin is able to throw his voice so that it appears to becoming from outside of his body. His disembodied voices can also sound like other people. He uses his talent to break up a marriage by creating a seen where a woman’s husband thinks he hears her and another man having an affair. With out a doubt his greatest trick is convincing the protagonist that he is hearing the voice of God. I shall not give away anymore. 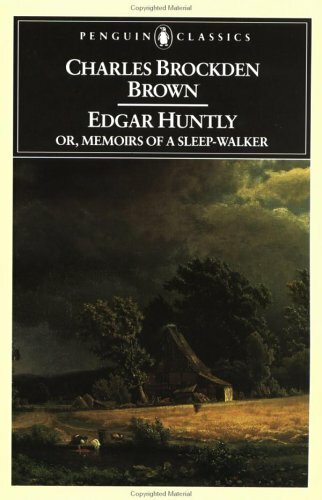 In Edgar Huntly, we find a similar story, but this time the twist in science is sleep-walking. I know that sounds a bit silly, but it is a fantastic story filled with imagination and dark mysteries. Brown is a talented writer and great story teller. But, why are they gothic? These stories are taken out of the traditional gothic setting of European castles and cathedrals and inserted into the American wilderness when it was still a dangerous wilderness that had not been developed and explored to what we know and see today. Gone are the days of the dark corridors and things that go bump in the night of the ancient castle. Here we find deep forests filled with the unknown that attacks our imagination with the wind through the trees and echo of sounds from wild animals that can sometime sound like the screams of a child. In the publishing of his first book, Wieland (1798), Brown became the first native born American author to become a professional writer. He made a living off of his writing, which was not very common his that day and age. Today, Brown was is the beginning of American novels and the american gothic genre. His works are taught in many American universities. Google his name and you will see. Brown wrote a lot in his short life. He died at the age of 39 in 1810 from Tuberculosis. For more about Brown visit here. 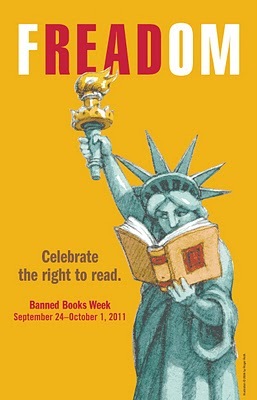 I do not know what is more sad, that people in this world see a need to ban books or that it happens so often we have a Banned Books Week, which happens to be this week. Check it out here. It really exists. Now I can think of some books that I would never allow into my personal library or if I owned a bookstore I would never carry, unless a customer asked me to order a copy of said book. But this is my own personal opinion which allows me to have what ever books I want to fill up the shelves in my library. I cannot understand why people would want to go through the trouble to ban books from public libraries and school libraries. When I first heard that books were being banned I was young and thought that it was an isolated incident. Sadly it is not as this map will show you what parts of the country are banning what books. Some of these books, Slaughter House Five, Of Mice and Men, To Kill a Mockingbird, are some of the first books I have ever read and loved. Other, Brave New World and the Twilight Series, are not as well received, but that should not matter. My biggest fear in this world is when a group of people starts something, where does it end? You ban one book because you say it contradicts the bible, as is what happened here. Does that not give the same rights of other people to ban the bible? I do not want either banned. I would like people to read for themselves and decided what is right and wrong. This brings me to my gothic twist. 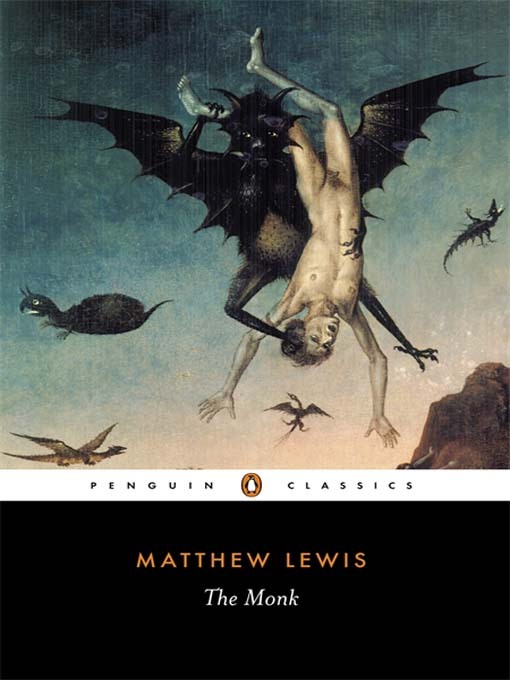 There is a great book entitled The Monk by Matthew Lewis. The story is about a devout monk named Ambrosio living in Madrid, Spain sometime in the 17th century, The people of the church and of the community say that he is without sin and has never broken a single rule of his order. He is extremely popular thanks to his sermons and his dedication to the church and the Holy Bible. He came to the church as a baby, abandoned on the steps of the abbey. His entire life is spent living in the church and being educated by the words and lessons of the faith. The book follows his down fall as his life both outside and inside becomes complicated with emotions of love and lust. He is first tempted by a fellow monk who reveals himself to be a woman in disguise. Later he falls in love with an innocent girl. I shall not spoil the rest of his fall into villainy, but I shall say that book makes it clear that the only reason why he lived 30 years with out sin was due to the fact that he was cut off from the real world outside the abbey. He had no exposure to people outside the church. He was in fact censored and grew up not knowing any aspects of the real world. The book, The Monk was itself banned upon its original publication in 1796. This is due to the fact that the book is an attack on the brutality of the Catholic Church in Spain during the Inquisition. Books teach us valuable lessons from the world that we would normally not experience in our everyday lives. We learn about different characters from different lands with different languages and customs. There is nothing to be gained by banning books. It does not make those parts of the world go away. It deepens our ignorance and proves the adage that the greatest trick the devil ever pulled was convincing the world that he does not exist. Join me in reading a banned book. My book of choice: Fahrenheit 451 by Ray Bradbury. In this world, books are not just banned, they are burned because the contradict the existence of the society. Since I mentioned briefly in the last post the fantastic stories of M.R. James I thought that he was owed his own post. So here it is. 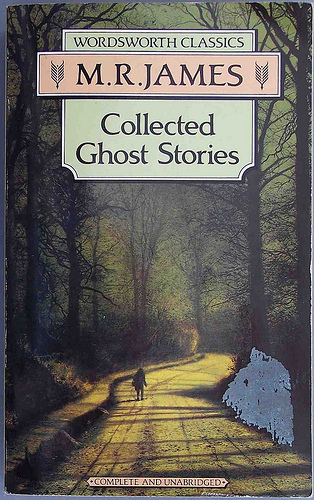 As I mentioned in that article I first found his book of ghost stories while browsing through a used bookstore in Belfast a few years ago. I had never before heard of him, but the title caught my eye since it included the word ‘Ghost’ and the price seemed more than fair, which was one pound, about two dollars. I bought it and quickly began reading that afternoon in mid september. I instantly loved the stories and found that each one was better than the previous. I have read many collections of stories and often I find that by the end I want to be done so that I can read something else and walk away from the collection knowing that I had read that that there was to read. Not this book, not his stories. Each year, right about this time of the seasons, I reread many of his stories, which have held up over time. What makes his stories so powerful is their atmosphere and their ability to turn a normal situation one of terror. He has a great ability to use his words to capture the atmosphere of the 19th century in foreign lands and bring them to our modern day eyes and imagination. His sense of details and how those details can and should be used is both fantastic and horrific. Please, if you have never read his work, buy or check out a collection of his stories and read them this Halloween and over the winter months. From his collection of stories I say that his best are The Ash Tree, Number 13, Count Magnus, The Stalls of Barchester Cathedral and my favorite among favorites, ‘Oh, Whistle, and I’ll Come to You, My Lad.’ In each one of these stories we find the questions, ‘can ghosts really cause us harm?’ To which James’ characters answer, ‘yes, they can.’ His horror is more than a bump in the attic or the creak of a door, it is a hand that reaches out the door of a room that cannot always be found, reaching for the neck of an innocent. His stories teach us that when you visit and old town or structure, be careful what you might wake up. Part of James’ ability to craft such stores comes from his education and his profession as a medieval scholar. He lived from 1862 – 1936 in England and was the Provost of King’s college from 1905 – 1918. 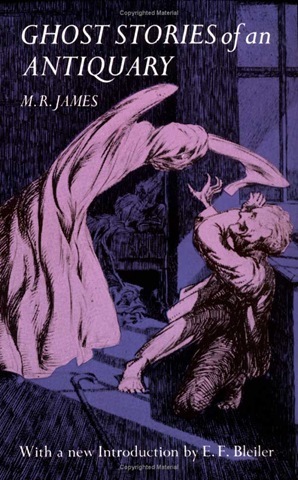 If Bram Stoker is the father of the modern vampire, James is arguably the father of the modern day ghost story. There are stories that he used to have gatherings in his study at King’s College around Christmas and at these gatherings he would read his stories. Believe me when I say that many of them are frightening. It seems like many great writers of the macabre come from this time period, the late nineteenth century or early twentieth century. It could be that they lived on the bridge from the world of candle light darkness as well as on the brink of the light bulb of the modern era. From where they stood, Stoker, James, Conan Doyle, Stevenson and even Le Fanu and Lovecraft all could see the world they came from and the future where they were heading. Each of these writers focused on the old parts of this world what has survived, been forgotten and rediscovered by some scholar or explore of nature, science and history. From them come works that have survived for us to read at night by the light of our modern world. These stories remind us that there is still much that is unknown about our world and in that unknown you can find your own imagination. I good friend of mine once told me that after he finishes a book he sends it to another friend so that they can enjoy it. Though I like this idea I could never do it. When I read a book that I really like I must keep it. It then lives on my book shelf with my other cherished books collecting dust until I come around to clean it off, hold it in my hand and think about the words with in its covers. I love coming back to books after I have read them. Sometimes I’ll read the entire book again, but then sometimes I’ll read only a few lines or not read a single word. I’ll hold the book and remember the imagination it gave to me. 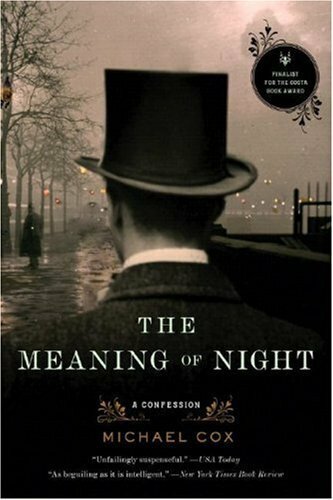 The Meaning of Night is a book that I loved from the first time I saw the title. The meaning of night, what is its meaning? The blank canvass for our imagination is what I have always thought. For those of you who likedThe Nature of Monsters this is another book I think you will find can scratch that 19th century-victorian-gothic itch. It is a story that begins with a murder and the opening line “After killing the red-haired me, I took myself off to Quinn’s for an oyster supper.” Yes, this is a story told from the point of view of a murderer, Mr. Edward Glyver. As the story progresses he describes for us in detail how he committed the murder. I tell you this because I have read that the biggest problem most readers have found in this novel is the fact that it is written in the first person and that person is a murderer. Do not worry this does not spoil the story. Michael Cox is an expert on 19th century gothic literature as well as the Victorian world. Like The Nature of Monsters this story feels as if it were written by someone from the period. The words and how they are used are methodical and for me they bring back so much imagination that was given to me from reading other stories from the time period. And why is it gothic? Setting and location. For the readers of the 21st century the world of the 19th century feels somewhat like a haunted castle. In our minds the streets are alight with oil lamps that cast oily shadows on the dirty cobblestone streets guarded by bobbies who use their whistles to echo out a crime into the night. It is a world that is mostly unknown to us other than the structures that are still standing for us to see and the stories that have survived for us to read. The rest of the detail we must filled in with our own imagination. For all good writers their words end where our imagination begins. Two years I bought a copy of Cox’s second book, Glass of Time. I have not yet read it, but when I set out to write this entry I read the back of the book and learned that Michael Cox died at the age of 60 in 2009. In this world I could not believe that his death had remained unknown to me. 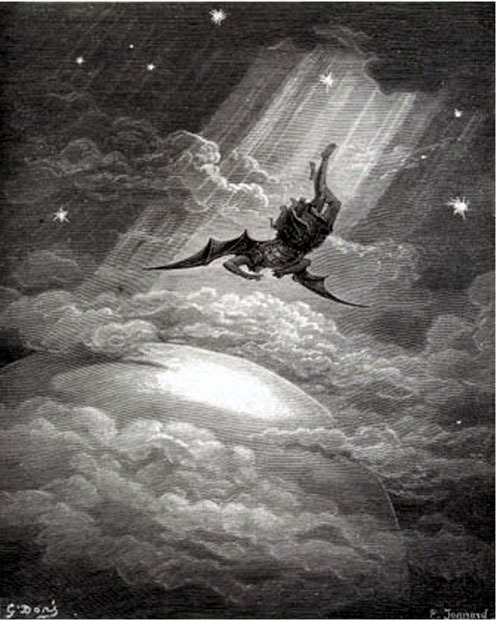 What is most remarkable is how his death influenced The Meaning of Night. For thirty years he had been dreaming up this story, taking notes and developing his characters in his imagination. But his own self-doubt stood in his way. His love and respect for authors such as Dickens and Conan Doyle gave him a feeling that he could not hope to write with such talent and prose. As he said, “I wasn’t confident that I could do it, and I couldn’t do it for 30 years.” Then in the early ninety’s he was diagnosed with cancer and underwent treatment to have tumors removed from his nasal cavity, brain and spine. As the cancer spread he began to lose his eye site. Rather than give up he set out to write his first novel, which became a mega success. To this day this is my favorite collection of short stories beating out Edgar Allan Poe and Ray Bradbury’s The October Country. It sits today on my shelf next to Cox’s two stories all waiting to be read, held, dusted and reread ever October just before Halloween. 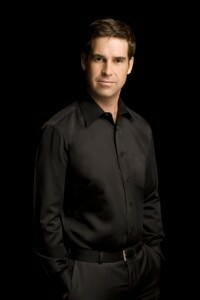 For more about Michael Cox and his death click here. I confess, I saw the film for ‘The Shining’ a long time ago and many time before I read the book. And guess what, the book is still better. As great as Jack Nicholson, Shelley Duvall, and Danny Lloyd are, their characters are only the shells of what you find in the book. Since both the book and the movie are great I would say that they are two different stories with the main different being in the book the hotel is the main character. 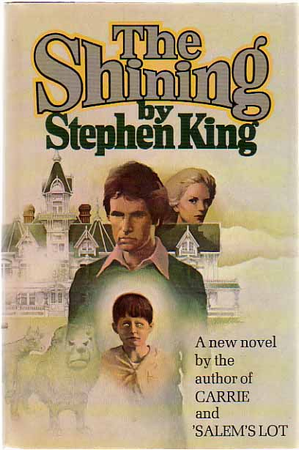 In The Shining King brings to live the essential part of gothic literature, the setting inside the haunt house. The Overlook Hotel is where the story draws most of its power and like I said before is the stories main character. For the reader the hotel creates many imaginary horrors both from the spiritual world and the physical world. In the physical world the hotel is in the middle of a world that is uninhabitable with out proper preparations, cut off from the rest of the world. Deep in the Rocky Mountains there is no civilization when the winter brings powerful winds and deadly snow. Yes, inside the hotel you are safe, but there is always the threat that something could go horribly wrong and there would be no help on the way. In reading this book you see that this idea is always in the back of your head and in the back of the characters minds since their lives are balance on a delicate string. With this physical danger comes an spiritual horror creating an environment where you are in danger is you stay in the hotel and in danger if you leave it to take your chance in the wild weather. For a more in-depth overview of the book click here. When I watched the movie I was always left with many questions that movies cannot answer. Movies are notorious for not explaining the entire story even if they are a great classic by Stanley Kubric. In reading the book I can tell you that all of my questions from the movie were appropriately answered. Stephen King does a great job in setting the stage for this story. His words are well chosen and the pace of the story is careful in that it walks you through the halls of the hotel and the inside of the mind of each of the family members, father, wife and son. The story is told in the third person in a way that gives the read a chance to see inside the minds of the characters and see not only their mental progression, but what they do not know or cannot understand. We see how they are all affected by the hotel and what ever lives inside of it and in each of them. This is another place where the movie falls short, because movies rely on dialogue and physical action. The genius of this book happens internally. We understand why Danny knows what is happening with his parents even if they do not know what is happening inside and between themselves. We also discover what the hotel is and why it wants Jack and Danny. I won’t tell you anymore other than you should pay attention to the clock. Overall the book is not as much about horror, violence, or a creepy hotel. It is about what happens to people, what makes people different, what makes them change, what makes them love, and what makes them do violent acts even against those they love. The strongest parts of this book are the characters. In this story we see that a character become the villain, hero, and pragmatists all in one. No one is entirely god and no one is inherently evil. What is the difference, our strengths and weaknesses. These weakness are augmented by the supernatural ways that remind me of Ray Bradbury. If you have never before read a Stephen King book this is a great place to start, but I warn you be careful or what is found in room 213. Such a great story deserves a great header. This book literally fell right into my lap. A close friend of mine, who knows how much I love vampire stories and graphic novels, found it in the recently published section of our local library. I nearly did not believe them, thinking that no library would voluntarily purchase this book for the general public. I also thought that such a cool idea for a graphic novel would never find its way to me by chance. It was not the first time I was proved wrong and I am sure it will not be the last time. First I love the title and not just I because I live in Maryland. The name Baltimore is old, older than the United States and the City of Baltimore, obviously. The name comes from a title held by the Calvert family whom were the Baron Baltimores that founded and governed the city of Baltimore before the American Revolution. (For those of you living outside of Maryland the state flag, which many think is a bit strange, is a combination of the Calvert and the Crossland family shields.) Sorry, enough about the name. The authors are Mike Mignola, who also does the creepy and wonderful illustrations and is best known as the creator of Hellboy, and Christopher Golden, the bestselling author of The Myth Hunters, Ferryman and Strangewood. This book is a must read for anyone who loves the horror of vampire tales and the supernatural gothic tale. The story goes, the world has been overrun by vampires, and not the nice vampires of the Twilight series, the Sookie Stackhouse series or even Anne Rice’s Vampire Chronicles. These are monsters that humans do not fall in love with. They are villains that kill for food with out emotions. They more resemble the vampires in the new trilogy by Guillermo Del Toro and Chuck Hogan, which I highly recommend. Baltimore is the hero of this story. A soldier from World War I who both creates and witnesses the awakening of the vampire plaque on the hellish fields of battle. What makes this story so powerful, and in my book what makes it gothic, is the fact that it is set in the aftermath of World War I. A war that more cruel and kill more people than most people today will ever understand. In tradition gothic tales it was always the setting that gave the story it troublingly scary punch. World War I was like a plague in western Europe that killed more than 15 million people, not just soldiers. Not only is the story hauntingly amazing, but the illustrations adds wonder to the imagination that this story induces. The skulls, the shadows and the fact that they are in black and white bring the story alive in visions that get stuck in your head and stay there long after you have finished the story. Mike Mignola has a unique tale for injecting the emotions of the macabre into his art. 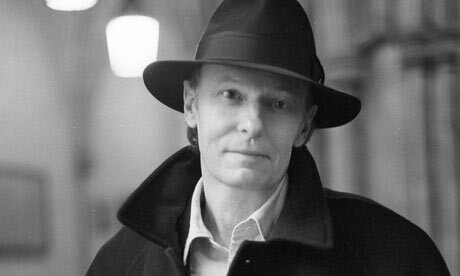 He also worked on the Francis Ford Coppola’s film Bram Stoker’s Dracula (1992). 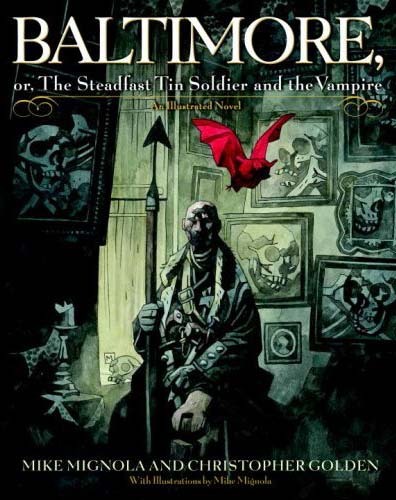 After the release of the Graphic Novel the story of Baltimore expanded to a comic series, which I have not yet had the pleasure of seeing. You can trust that I shall when my reading list allows me. I have also heard rumors for sometime that there are plans for this story to become a film following the success of Mike Mignola’s Hellboy. If anyone knows anymore than I do, please share. I loved this story. of things outside could not have entered there. contempt and fury even as he died. By the prickling of my thumbs, something wicked this way comes . . . Open locks, Whoever knocks! These famous words were spoken by a character known as “second Witch” in Shakespeare’s Macbeth. Arguably one of Shakespeare’s most well known plays, it brings to mind gothic ideas. A dark castle with ghosts, murder and treasonous plots hatched in the middle of the night. There are witches who speak portentous words and those words excite a feeling of anticipation of a coming unknown menace. Together they make the perfect title for the superb novel by Ray Bradbury. 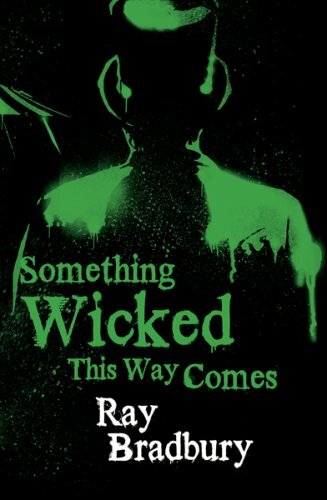 Something Wicked This Way Comes is a story about two 13-year-old boys named Jim Nightshade and William Halloway. They are more like brothers than best friends partially since they were born minutes apart on either side of midnight on October 30th (Will before Halloween, Jim in the first moments of Halloween). Though the two are very alike they come from different families that happen to live next to each other. Jim comes from a broken home and has only his mother to care for him; Will comes from a comfortable home with two parents, but his father (Charles) is much older making him somewhat disconnected from Will. And what better names are there for characters than William Halloway and James (Jim) Nightshade? This book was published in 1962 and was latter adapted into a film that I have mixed feelings for. It is not that it is a bad film, but it is not how I imagined the story in my mind and this is a story that will excite your imagination. 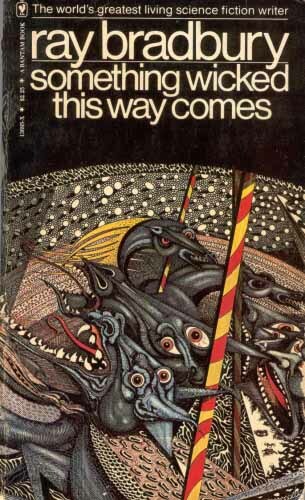 If you have never read anything by Ray Bradbury this is a great book with which to start. Here is a link to his website and a list of other stories by him. If you have read it please share with me your experience; if you have not read it, please ignore me and read it and enjoy. Werewolves have been a more tricky sell in the literary world than vampires. (Even though vampires are getting to be a little done.) Through out the history of the genre, Vampires come out every night to romance humans into giving up their blood through a deadly bite on the neck. What could be a more romantic way to die in the arms of a monster? Wolves can be a little messy. In the tales, vampires have more history from living hundreds and even thousands of years. The old ones can tell us stories from the long forgotten past since they are themselves living history. One of my favorite vampire novels is Pandora by Anne Rice, which deals with a vampire living during the time of the birth of the Roman Empire. I love a good historical/monster/vampire novel. Werewolves are a different beast. Pun intended. Like vampires, the nature of werewolves varies from novel to novel and series to series. The wolves can be huge beasts that mimic prehistoric mammals; they can be a man/wolf hybrid that walks on two feet; or they can be your regular real world wolf taking the definition that a werewolf is a man that turns into a wolf literally. Werewolves differ in their nature as a predator as some attack at random in a frenzy of hate and hunger while others have control over their transformation. Through all their differences and similarities vampires have had the edge over werewolves for a very long time even though the folk tales for both monster dates back to the same time period. I came across the galley for this book about a year ago and read it this summer. It is a quick read, but carries a very engaging story. The nature of the werewolves are very different from what I am used to reading in other novels that include werewolves. In this world a werewolf does not change only at the full moon. It changes when ever the moon is out and with that change comes a tough battle between the human and the wolf. This story takes place in the deep wilderness around Alaska and Canada, which means that as the moon goes through its phases, like the sun, it approaches a time when it does not set, keep the wolf in power longer than the human. Both wolf and human hate each other, but are stuck in the same body that will live forever unless it is killed. The writing in this book is not the best I have seen, but the story is strong and the imagination is original. I like what Wellington did with the werwolves in that he brought them into more of scientific/lunar realm answering the question why do werewolves only turn on the full moon. In making the wolf and human hate each other he creates a character that is both a blood lusting killer and a victim. 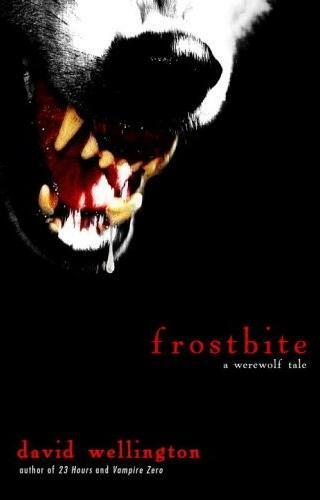 I would recommend this book to anyone wanting to try out a werewolf novel or to anyone whom likes werewolf novels. There is a sequel that I have ordered through my library and hope to read soon. 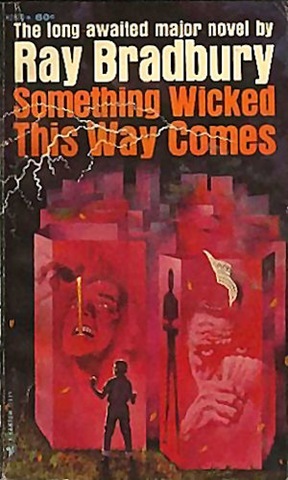 For anyone interested in reading more novels by David Wellington he is quite the horror writer. Check out his other books here. First, this guy knows how to write a novel. I did not hear about this book until recently and when I did I had to bump it up to the top of my book pile skipping other novels that have been waiting patiently for more than a year. It received a lot of hype this past Spring before it was published in July. I heard about it from a from a friend of mine and then read about it at one of my favorite book blogs, here. Having read Frostbite earlier in the summer I wanted to double-down and try my luck again with another were-book. The cover and pages of the book also look incredible with the red trim and black jacket. This was the first book I have read by Glenn Duncan who has also written Death of an Ordinary Man, The Bloodstone Papers and I, Lucifer. I am now ready to read more of his work after reading this thrilling novel that is very gothic/romantic. Every page had a new surprise and the nature of the werewolf was the exact opposite of Frostbite. The difference can be likened to the vampires in Twilight Series to those in The Vampire Chronicles by Anne Rice. In this world, the man has control, but must live by the hunger, lust and animal urges of the wolf. This book also reminded me of Interview with the Vampire in how it was written and in the voice. It is told through the journals of Jacob Marlowe who is, as the story begins, the last werewolf. All of his kind have been hunted down and killed, by a paramilitary organization, leaving him as the last. 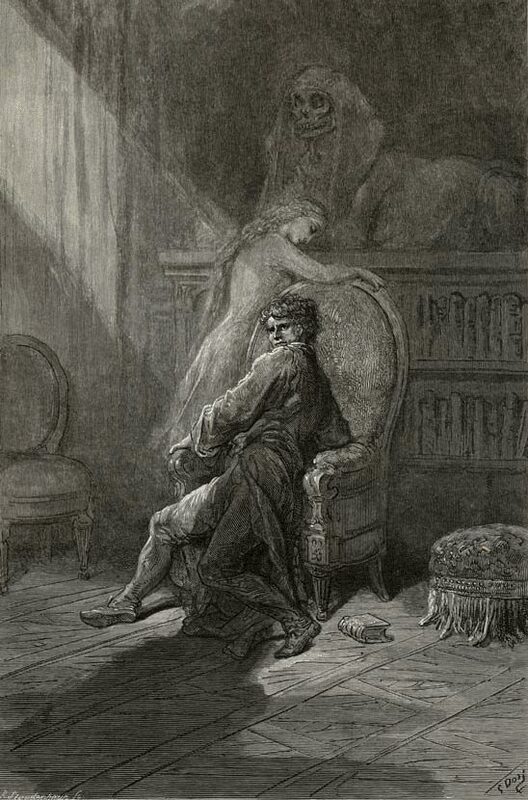 Similar to what we find in most vampires stories, Marlowe tells us the story of his life, about how he was turned, when he was turned and how he had to leave his old life behind to survive through time never aging in more than 150 years. There are scenes of lust and scenes of love that may seem strange and cruel, but thanks to the clever writing we understand the mind of the wolf. In understanding we again see the werewolf as both the villain and the victim that we love and hate. The best part about the book is the language and how Duncan develops the story through the words of the main character. 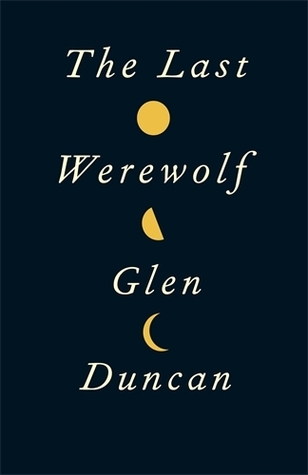 Duncan knows how to tell a story and tell it well with strong prose that at times reads like poetry. It might be a little hard to get into, but once you get use to his writing style you will see that it is the way the novel needed to be written and how the story was meant to be told. The book ends with a hint of a sequel, which I shall be eagerly await. Give me your thoughts on these novels and another other werewolf literature you care to share. Doubting, dreaming dreams no mortal ever dared to dream before; . . . It is fun how we can live our entire lives and not know that there is an artist, author or some creator that will blow our minds away with their work. It seems that as I get older, to my delight, I find more and more of these people in the world. Several years ago it was the writer Neil Gaiman. I know, it was not until I finished school that I learned of the awesome works of Neil Gaiman and now I have read just about everything of his there is to read including all four volumes of the Sandman series. This summer I found the etchings of John Taylor Arms at the National Gallery of Art. 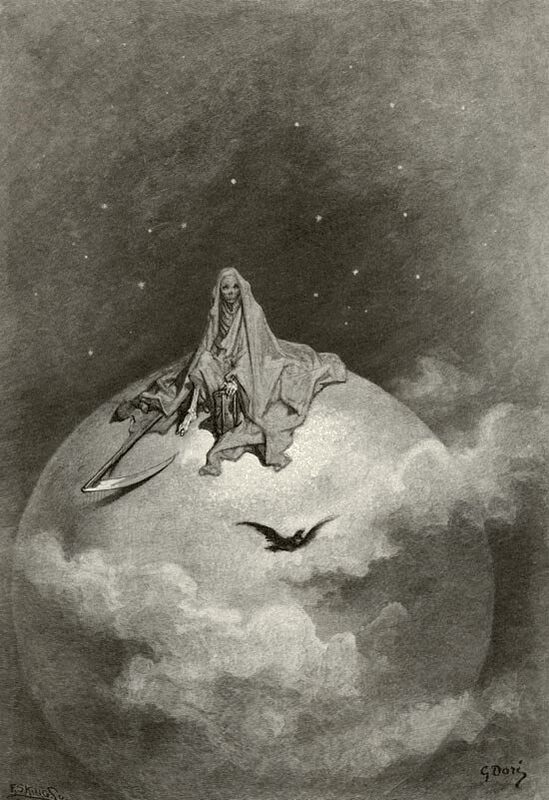 Now I wish to share with you another artist, Paul Gustave Dore. I found him this summer, while researching Dante Aligheri as I was reading the Inferno. 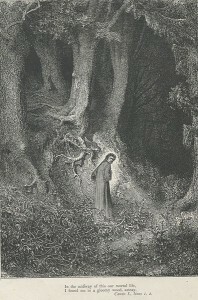 In researching I found this illustration of a lost pilgrim (Dante) in a dark and lonely forest and thought it to be wondrous and perfect imagery for the text of the Inferno. Little did I know that there would be more illustrations such as this to compliment not only the first volume of the Divine Comedy, but for all three volumes, Purgatory and Paradise. Again, as in the case of the work of John Taylor Arms, the attention is in the details of his work. When you look at one of his illustrations you can see the amount of time, energy and patience he put into it as you can feel that energy pervade out of it. The work is like magic like the words are poetry. 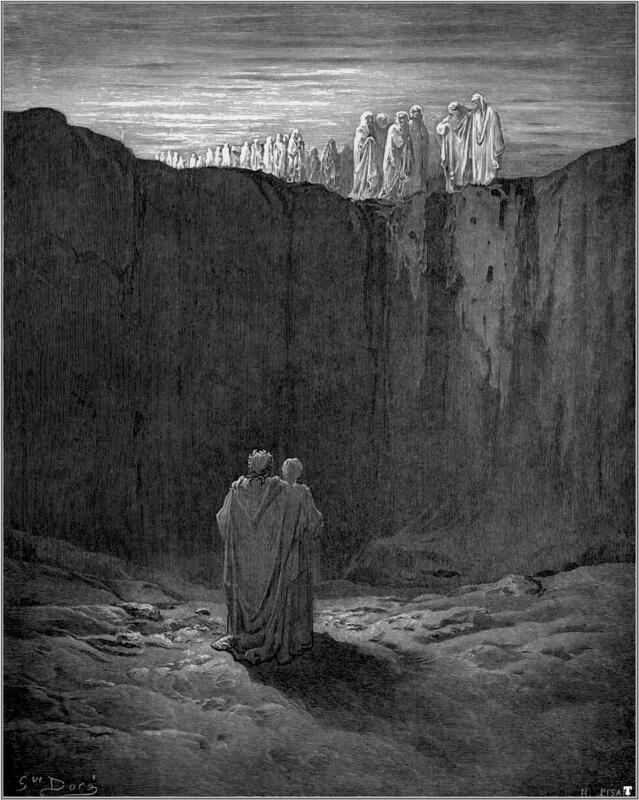 Don’t misunderstand me, I love using my imagination when every I can in reading poetry, prose, short stories or novels, but there is a different experience when you have images such as these from an artist such as Dore. There is a quality that comes with them and an experience that follows. It is art and poetry combined into one symphony that any person whom appreciates the macabre will enjoy. The gothic appeal is strong in his work as he shows the beauty in the tragedy. 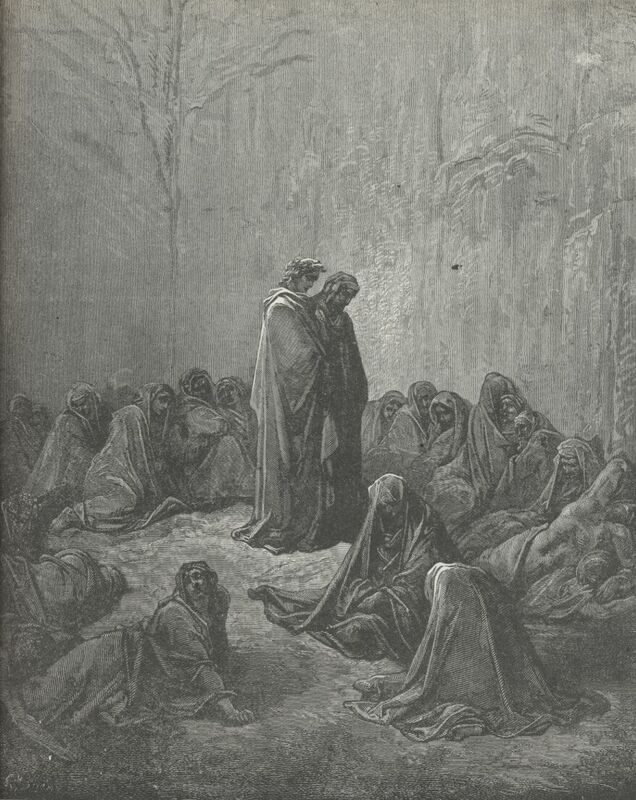 Here is a brief biography on Dore. 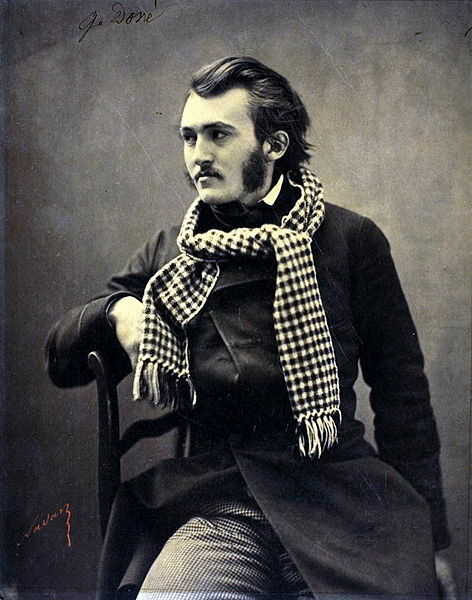 Born in Strasbourg, France on January 6, 1832, Dore made a name for himself as a prolific artist, illustrator, engraver and sculptor, but he worked primarily with wood and steel engravings. His artistic talent was recognized at an early age by his parents and friends. When he was 14 his parents moved to Paris. While out walking he saw in the window of a publishing company engravings to match different works of literature. Knowing he could do a better job he brought his work to the shop the next day and showed them to the publisher, Charles Philipon. Philipon was amazed by what the young Dore had to show him, but thought the work to be was too good for the hand of a teenager. 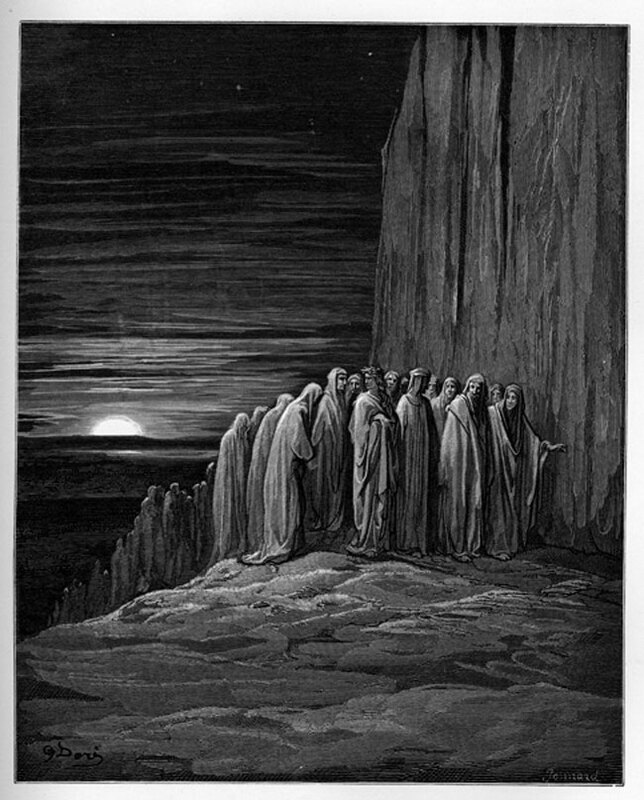 After Dore proved the illustrations to be his own he was given a job. 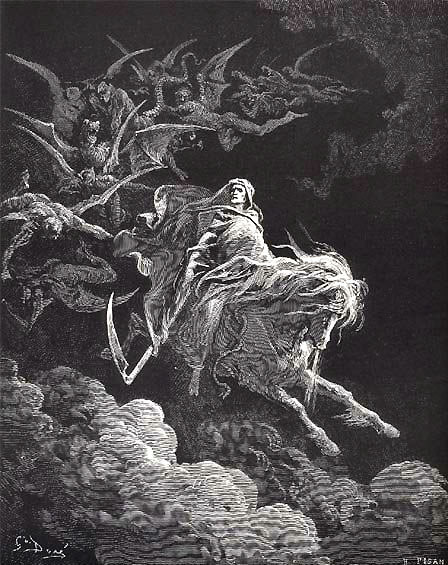 Early in his career he was commissioned to illustrate the works of Lord Byron, Miguel de Cervantes’ Don Quixote and the The Old Testament of the Bible (1866), which made him famous not only in France, but around the world. 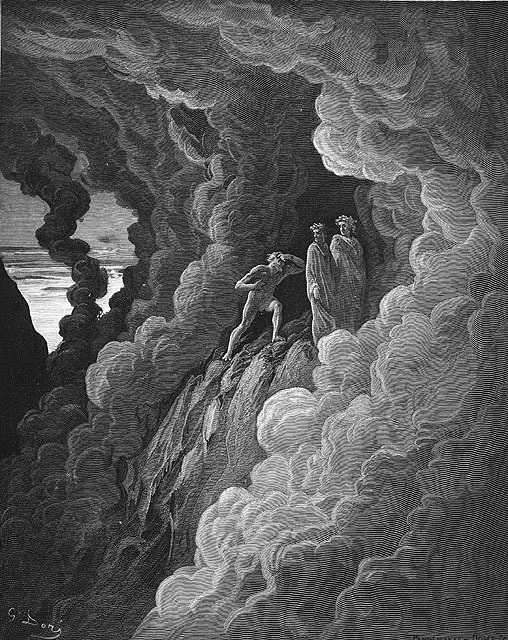 What he is most known for, however, are his illustrations for Dante’s The Divine Comedy, Milton’s Paradise Lost and Poe’s poem, The Raven. In his life, he illustrated more than 200 books and thousands of illustrations. He was a workaholic and managed to produce a lifetime of work in a short life. He died after a brief illness at the age of 51 in 1883. He grave can be found in the Pere Lachaise Cemetary in Paris. His work is unequally in talent and imagination as he brings to life the very wonders of the classical works we still love and read today. As soon as I discovered that there is for sale as book of his illustrations to the entire Divine Comedy, I knew I could not finish the 100 cantos without his art. I find it difficult to understand how one person could produce so much work and have each one be excellent and amazing. Recently I bought his work on Poe’s The Raven, which is one of my single favorite pieces of writing. His work is deep and thoughtful, complete and emotional. He seems to be able to draw out with an illustration the same passion and imagination that the author wrote in with words. The many collections he created are a testament to his talent, dedication and respect to his craft and the works of others. He was born with a unique talent that few have ever had. We are luck that at an early age he recognized that talent and was able to pursue it until the day he died. Please share with me your thoughts on Dore’s work and any artists you think share his abilities and passion. To read or not to read, that is the questions I have when I begin a book that I am not too sure about. This dichotomy can be a tough thorn in the mind of many readers whom find a book that excites them and then find out that the beginning of the book is not at all what they thought it would be. I hate quitting in the middle of a book, but it happens. A bad book is a bad book and sometimes it is a waste of reading opportunity to finish a bad book just because you do not want to quit reading it. I found this book, The Gargoyle, at the same time that I found The Thirteenth Tale. As you may have read, I loved The Thirteenth Tale, which I read first. It was easy to get into and easy to finish. The Gargoyle was entirely different beast. After reading the first fifty pages I was convinced that this was not a book for me. Though the first fifty are engaging, interesting and well written, there is a high level of the gruesome and the gritty. The book opens with one of the two main characters, whom is also the narrator, involved in a horrible car accident and details his recovery from his awful burns. But it was not the gruesome that turned me away; it was the victim of the accident. When I read a story I have one simple rule: I must like the main character. This doesn’t mean that the main character needs to be a good person or an honorable person. They need to be someone who, whether good or bad, I want to know more about. So I nearly walked away from this book, but before I gave up I read this online review. Thank goodness I did. The review recommended this book to anyone who enjoyed The Shadow of the Wind, I stuck with The Gargoyle and it makes me sad to think that I nearly put the book down and did not read this wonderful story. I am impressed that this is Andrew Davidson’s first novel as the layers of the story are connected in a masterful way that may not, as I am proof, be apparent in the beginning. To reiterate, this novel is about a man who is horribly burned in a car crash that for the most part is entirely his fault, but also part of his fate. Like The Thirteenth Tale, this is a story about stories. The narrator tells of how he was burned and how he met Marianne, but she tells him stories of another life. Her stories create the background to his recovery and the love that does not only grow between them, but was already there. Mixed in into the plot are several side stories of other cases of historical love that add to the story of their own. I enjoyed the addition of these side short stories that are quite touching. This is a great book and one that will read again someday. Here is an interview with the author if you are interested in hearing more, or there is this review, but both come with a spoiler alert. Covered with sackcloth vile they seemed to me, / And one sustained the other with his shoulder, / And all of them were by the bank sustained. O mad Arachne! 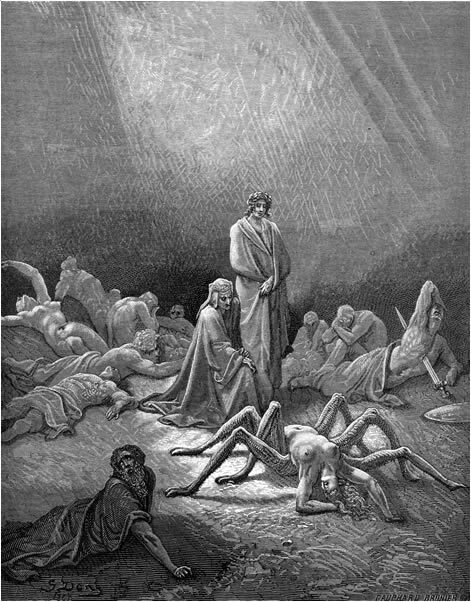 so I thee beheld / E'en then half spider. I first read about this book in a small pamphlet by the bookseller Indie Bound more than a year ago and immediately knew this was a book I had to read. I loved The Shadow of the Wind and was excited to discover that Zafon had written a young adults story. The pamphlet said that the book was being published in May 4, 2010. I checked the advanced readers copies at the bookstore where I work, since I was not in the mood for waiting what was only a month before the book’s release. Sadly we had no copies, so I waited. Two months went buy and I saw in the bookstore computer that we had ordered two copies. They were late to arrive. More time went by and they still were late. Instead of worrying about the book I went forward with reading other books and soon forgot about this book. Then, this past winter, I remembered it while reading another book. I again checked the order form at the bookstore; still two copies had not arrived. I asked the owner of the bookstore and she said that she did not know what was preventing them from being delivered. I then decided to check the library, which to my great surprise had the book. Immediately I went and looked for it, but it was not on the shelf under Z for Zafon. I thought that someone had checked in out and decided to wait. Again, more books distracted me until again I was reminded of this title. I checked the order form, which now we were expecting two copies of the paperback edition. (It takes one year for a book to be released in paperback.) As the date of May 4th came and went the book still did not arrive. I refused to wait any longer and checked back with the library that told me that it had accidentally been filed under Rui for the author’s middle name Ruiz. I check and I could not find it under Rui. The reason why I tell you this is because the author’s other and perhaps most well known book, The Shadow of the Wind, is about a boy who finds a book in a used bookstore and learns that this is one of the last copies remaining after a vengeful villain sets out to destroy all the books the author ever wrote. In my head I imagined a sinister person going around and taking all the copies of this book and casting them into the mist. 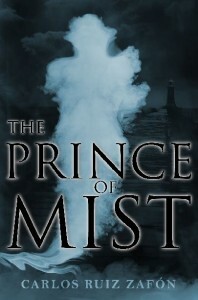 I am not a conspiracy theorist, but I think some coincidences are fun and I had a great time not being able to read this book, The Prince of Mist. It turns out the book was put on display elsewhere in the library. Finally, I had the book. If you can find the book I would recommend it. Though it is not nearly as good as The Shadow of the Wind it is still worth the time as the imagination in the book is fun and creepy. There is one scene in-particular that reminded me of the movie Poltergeist. I’ll say no more and leave it as a surprise. Where the book is weaker is the character development and the over all structure of the book. Zafon says on his website that this was the first novel he had ever published and for that I applaud him since I have read some other ‘first novels’ that have been well below the authors later talent. It is a book to read out loud either alone or with listeners. I am not the fastest reader; I like to take my time with a book to research, study the stories’ structure, learn new vocabulary and dwell on the new ideas I find in the pages. My only problem with reading this way is that it takes time away from other books. For a long time, this book sat patiently in my library. I first spied its cover and title a few years ago when it was published in paper. I bought, but it had to wait to be read. Onto my pile of unread books it sat, the pile never shrinks; it only grows. 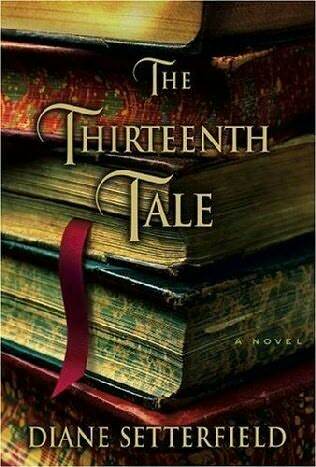 Finally I read, The Thirteenth Tale, by Diane Setterfield. I like books to be kept secret from myself; there is little better than opening the first page of a book knowing next to nothing about what is going to occur. So it was when I began reading this story and I quickly learned that Diane Setterfield is a talented author who knows her gothic literature. In a way this book is a revival of what I have come to understand to be traditional gothic literature. What I mean to say is this book feels like you are reading a compilation of Jane Eyre, Wuthering Heights, The Castle of Wolfenbach and the great satirical gothic novel Northanger Abbey. Like these gothic tales this story is written within the halls of a once great historical house that manifests itself like another character, a character that lives in seclusion and keeps many secrets including the title. What is the thirteenth tale? The thirteen tale is somewhat like the thirteen floor or the thirteenth room in most hotels in that there is no such existence. In this case, however, superstition has no part. The book begins when a young antiquarian bookseller and part time biographer, Margaret Lea receives a letter from a famous English author, who asks if she will be her biographer. Tell me the truth, is the phrase echoed in the request by the author, named Vida Winter. Margaret knows little about the author as she has a passion for reading novels not of this century. Before she accepts the job she researches Winter’s life and discovers many inconsistencies. The night she receives the letter she sneaks down into the bookstore she and her father run and finds a book of short stories Winter. Thirteen Tales of Change and Desperation, by Vida Winter. She takes the book back to her room where she reads and reads and reads. Like the young boy Daniel in “The Shadow of the Wind,” Margaret is stolen away by these stories and gives up an entire evening to finishing the collection, but she is lost when she learns that there are only twelve stories. The missing story combined with the suspicious life of Winter draw her in to the job. So the novel begins with the missing story and continues with why it is missing. This is a story about stories in the gothic realm. It has ghosts that are not quite ghosts, families that decay in crumbling houses, and a giant that is a fine baker. But as in all good stories we never see what is up ahead and we do not know the truth until the story has been told. I never once guessed right as to what would happen next and when the story was over I felt moved by what had just happened. For more of information on the story, visit this site. Taking a break from gothic stories and architecture, I read this article on NPR this morning and wanted to share. 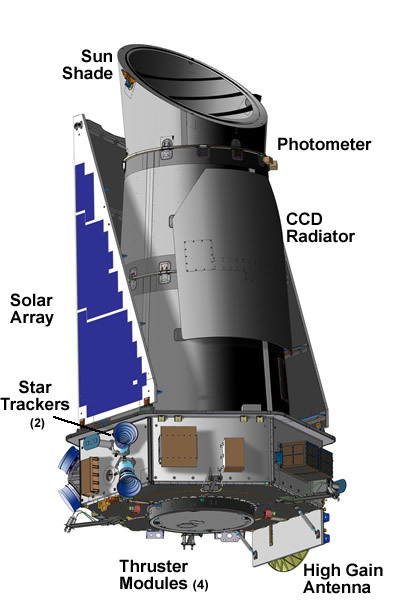 Apparently scientists, using the Kepler spacecraft have found a planet circling a near by star, 750 lights away. 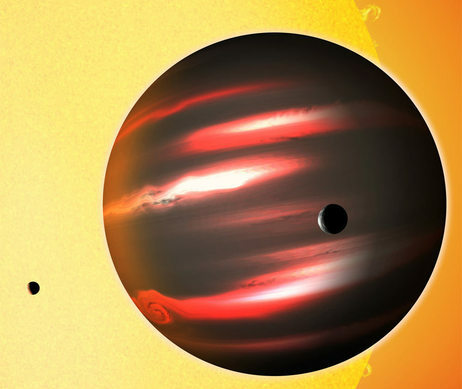 What makes this discovery stand out from all other planets we have seen beyond our solar system is that this planet reflects little to no light even though it is very close to its sun. The planet is a large gas giant, like Jupiter, and is much closer to its star than Jupiter is to our sun. To put this in perspective, if Earth reflects 37% light, making that beautiful blue, this planet reflects less than 1%, making it darker than coal. To read the rest of the article, read here.